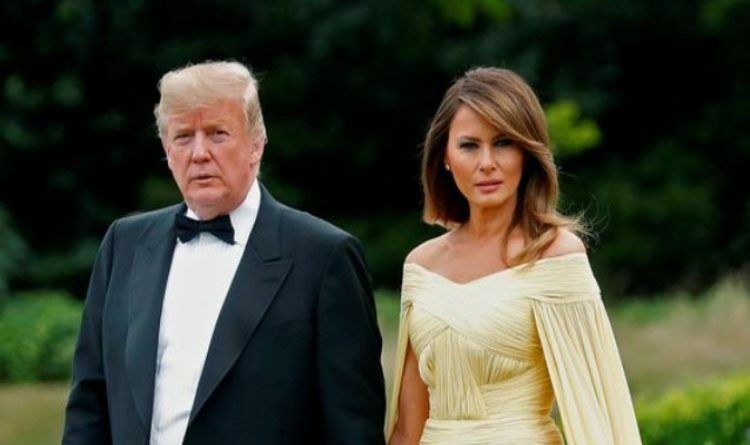 Melania Stuns Everyone At Blenheim Palace’s Black-Tie Dinner In Gorgeous Yellow Dress – Here Are The Photos! 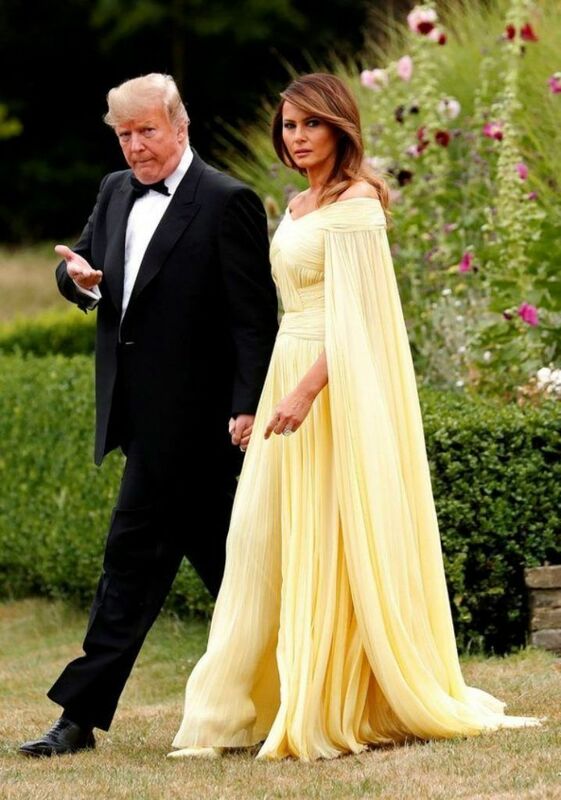 July 12, 2018 July 13, 2018 Natalie D. 4041 Views 1 Comment Black-tie dinner, Donald Trump, Melania Trump, U.K.
On Thursday, President Donald Trump and First Lady Melania Trump arrived at the spectacular Blenheim Palace for a gala dinner. We were not surprised that Melania dazzled everyone with her grace and elegance, but we were amazed by her confirmation of her impeccable style. 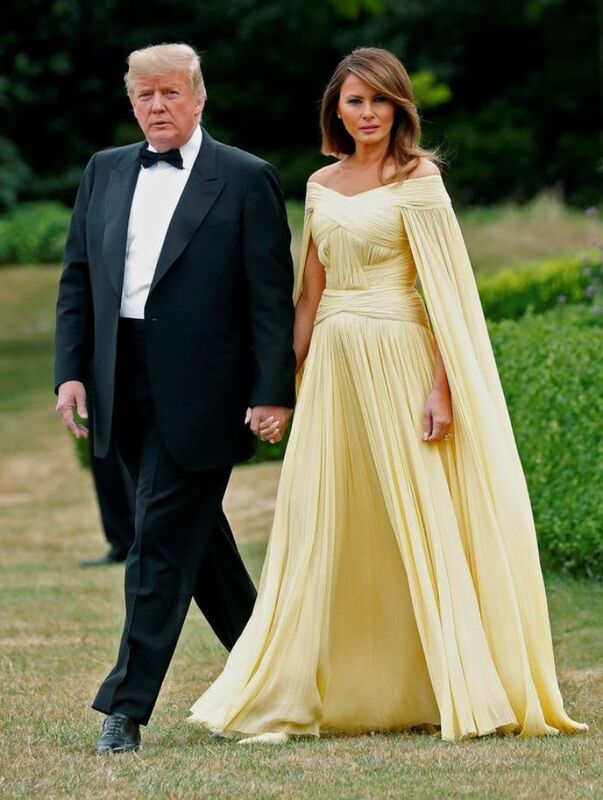 First lady Melania Trump wore a buttercup yellow off-the-shoulder floor-length gown, with ruched detailing across the bodice, a full skirt and a cape overlay by New York-based J. Mendel to a gala at Blenheim Palace. She paired the off-the-shoulder gown with floor-length pleated sleeves with matching silk pumps by Manolo Blahnik. Melania, kept her jewels simple, with a pair of stud earrings and her engagement ring. 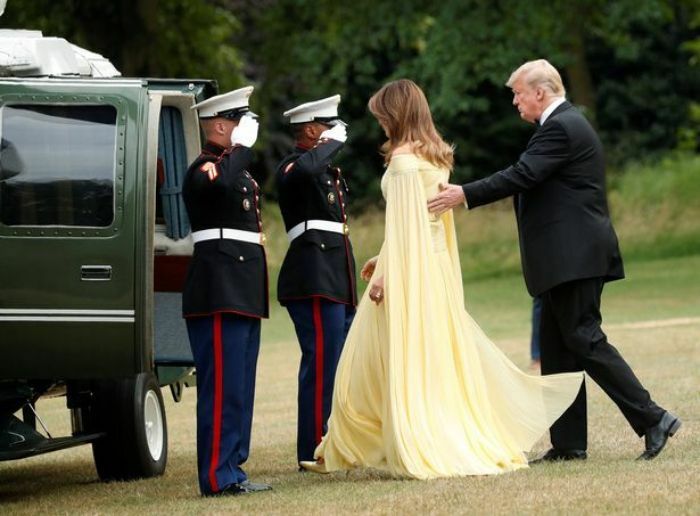 The president wore a black tuxedo for the occasion as he escorted his wife from the U.S. ambassador’s London residence in Regent’s Park to the awaiting helicopter Marine One. Always elegant and classy! Melania Trump may very well be the best first lady that our nation has ever seen. She is such a valuable asset to our president. There couldn’t be a more elegant, graceful, fashionable, lovely First Lady. FLOTUS Melania is simply stunning. That’s because she’s proud of the great nation we live in for what it was and is not for what she wants it to be. We are so fortunate to have First Lady Melania representing our country. Melania is the explicit definition of class, elegance, and grace. She definitely is a role model for young girls in America! She is a beautiful, exquisite First Lady.